It’s a beautiful July morning, sunny with a bit of a breeze. The dew is still on the grass. Time to do the farm chores. When I step out the door, snapdragons and a heliotrope greet me. The blue flowers have a wonderful, sweet fragrance. Otto and Holly tag along. They love to follow me everywhere. 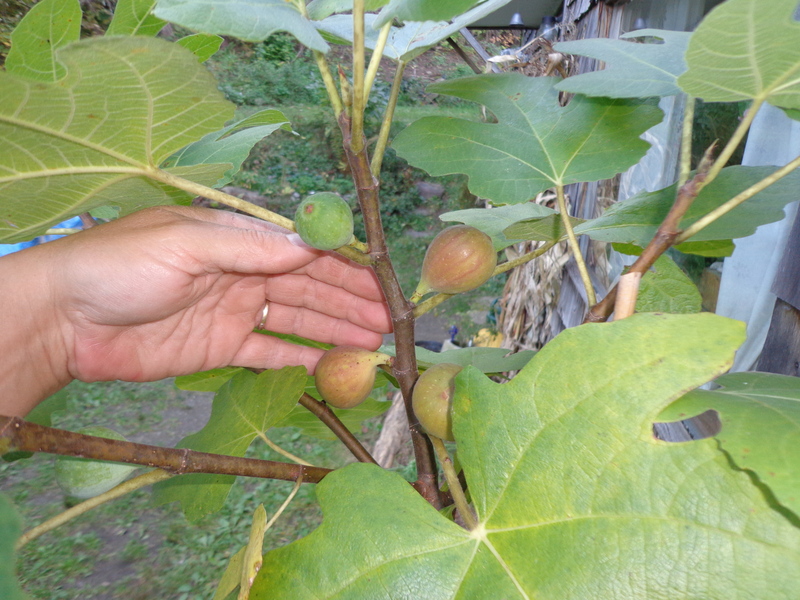 The fig tree has four good-sized fruit with many more small ones on the way. Time to give this tree some fertilizer to help ripen the crop before frost. My new yard centerpiece, impatiens on a log. They actually sit on the septic tank clean-out cover, marking it so nothing heavy (like a tractor or horse) goes across it. Day lilies and bee balm brighten the garden beneath the crabapple tree. Vista and Maddie, hard at work mowing the orchard. Cheap laborers who love their job. Kai and Cary are out enjoying a little morning sun before their major nap of the day. The black raspberries are ripening! Time to make some jelly. 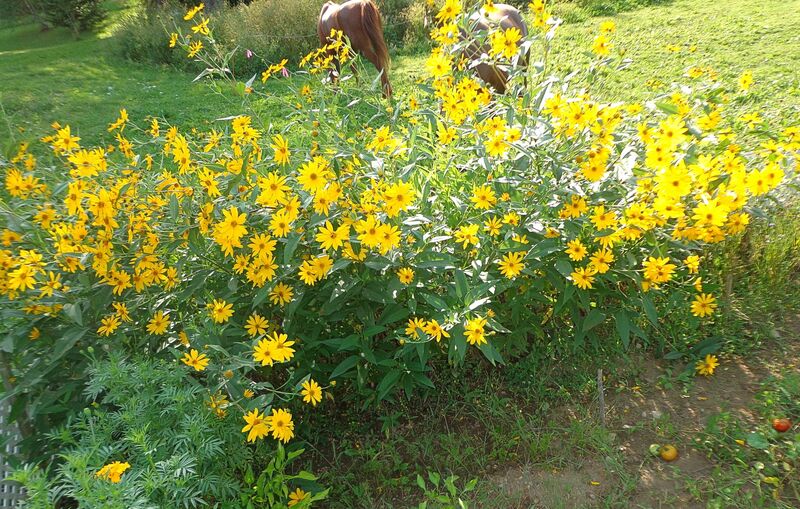 Black-eyed Susans make a lovely wildflower accent beside the iris bed. 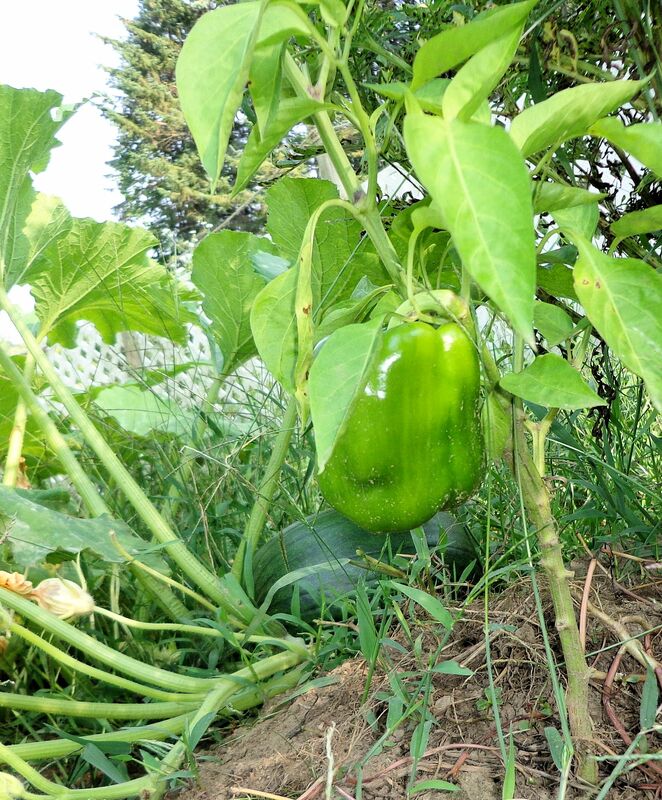 The recent rain has spurred the garden to exuberant growth, both vegetables and weeds. Finally made it to the barn! The first and third chick hatch eat together peacefully. The second hatch is too busy catching bugs and hasn’t responded to the breakfast call yet. Little guys and big sisters share the water dish. Someone else would like to have breakfast with the chickens. Two chipmunks live in our barn. They were being pretty decent little guys until one decided to chew the nozzle off a gas can. Not sure what the attraction was, hydrocarbons? Maybe it’s time to bring home a Barn Friend cat from the Humane Society to send the chipmunks packing? With all the distractions, it’s a wonder I ever get the barn chores finished! 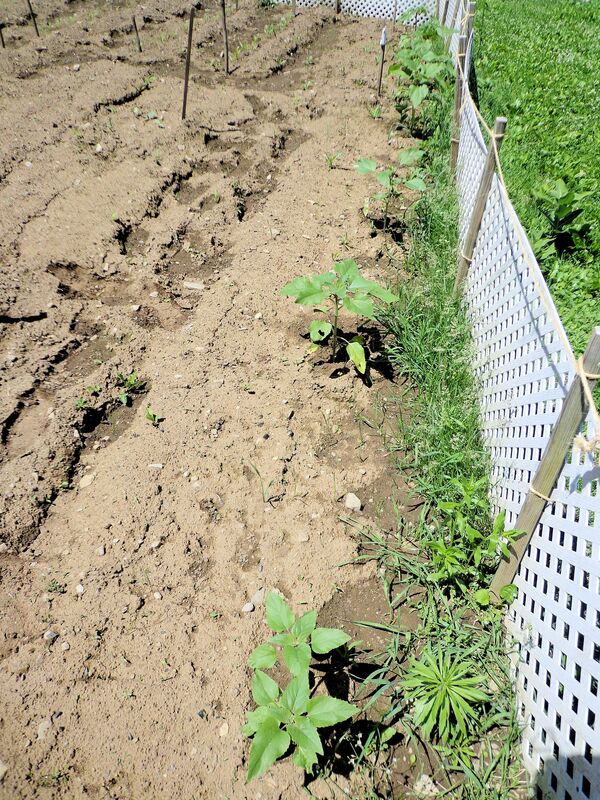 After much weed pulling, tilling and fence installation, the garden was ready to plant last week. It took two days to get all the seeds in the earth. The weather has been so dry for so long that the dirt was like talcum powder. I watered after planting to give the seeds a start. The weather forecast was for rain over the past weekend and through most of this week. Happily, we finally got a good soaking yesterday afternoon and overnight. It poured! Now the sprouts will start to pop up. 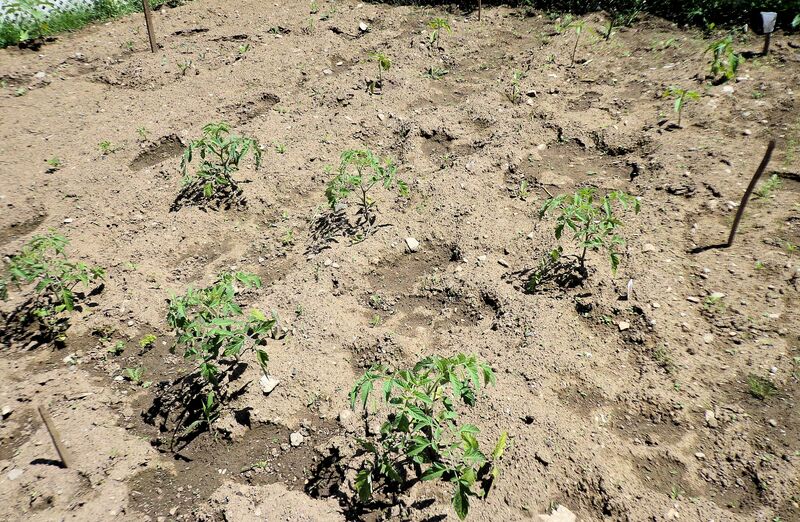 It is time to set the last of the plants in the garden: the tomato and red pepper seedlings. These came from a greenhouse last week and have been hardening off outside in the shade, preparing for the harsh conditions in the full sun and open air. The tomatoes already have flowers! 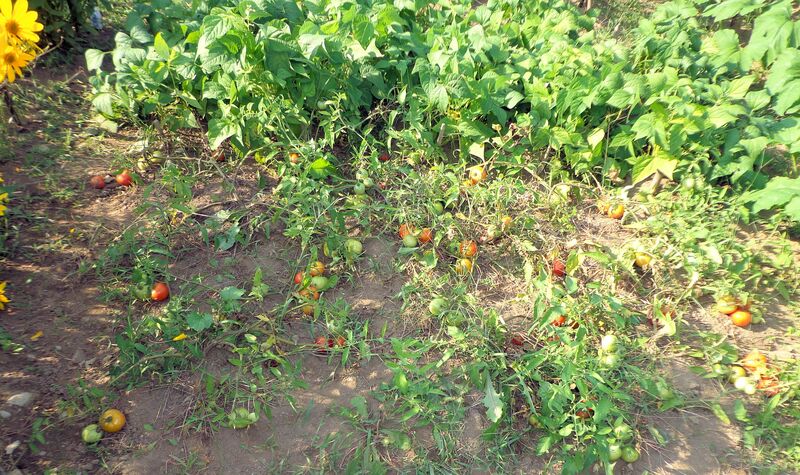 The variety is Early Girl, a nice medium-sized tomato that is very early. Usually I get my first fruit by mid-late July. Yum, can hardly wait for that juicy, home-grown taste! Here are some of the seeds I’ll be planting today. Just seeing all that lovely produce inspires me to get out there and weed and till! 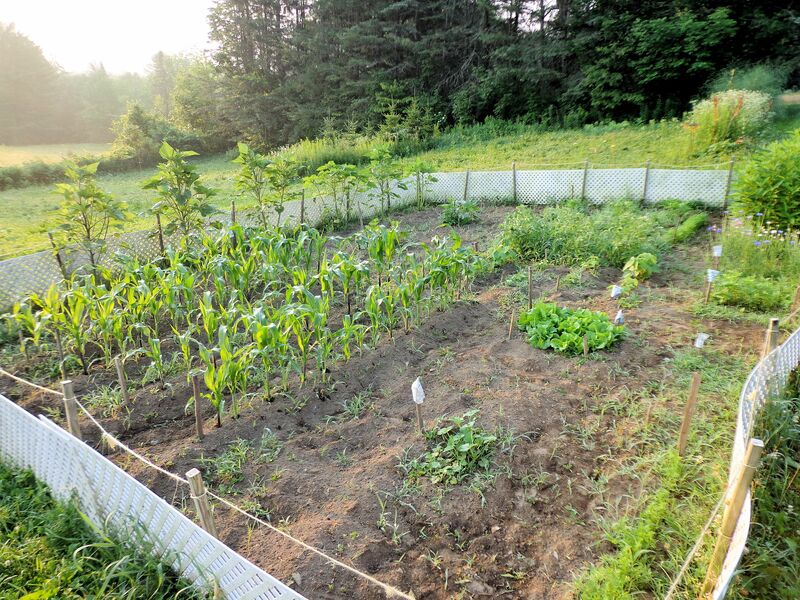 Currently the garden is little more than a 50 foot square spot of dirt choked with weeds and overgrown with Jerusalem artichokes in one corner. The area will quickly transform, with my exertions, into a fenced spot of fresh earth marked with rows of newly sown seed. The spring has been cool and dry, again. Chance of frost still exists, but I’m willing to get started now. Tomorrow’s forecast is rainy, perfect for jump-starting plants. 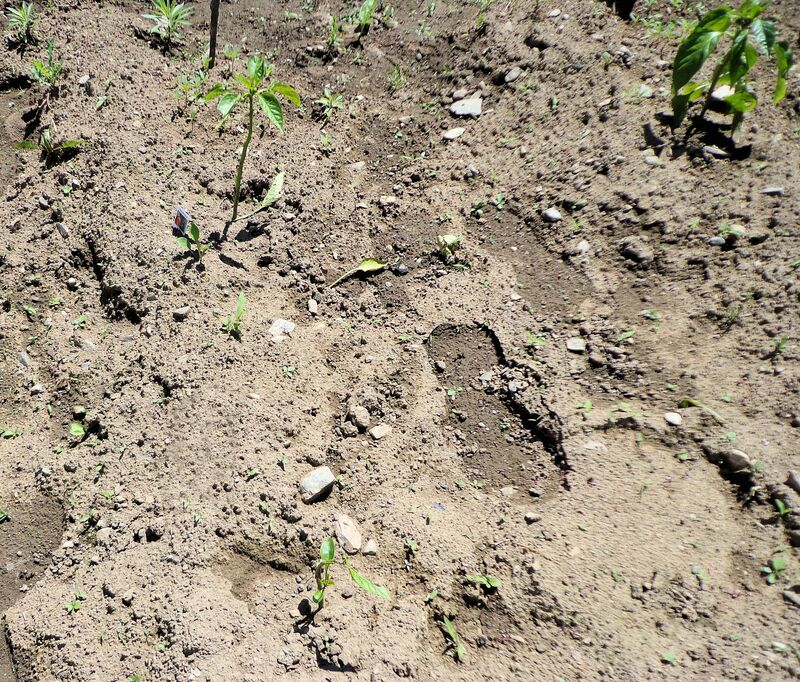 Next week I will put the tender tomato and pepper seedlings in the ground. By the first week of June we should be safe from frost. Yesterday was 86F, with lots of sun. Today is cloudy and mid-fifties. The weather is so changeable in Maine in spring that it doesn’t do to take something like last frost dates for granted. It’s very exciting for me! My first figs are ripening! They are getting a pretty pink blush. When the color is mahogany they will be ready to pick!! The little tree is ripening six fruit. Can hardly wait to eat them. I bought some fresh figs are the grocery store last week. They were sad, wrinkled and over-ripened things, but still better than dried figs. The fig tree is in a race with the weather. Temperatures have remained warmer than normal here. We’ve gotten several light frosts, mostly right around the full moons. Covering the tree at night with an old bed sheet has spared it from being nipped by frost. If the temperatures dip any lower than about 28F, I will have to move the tree inside. The full sun it receives outside is spurring the fruit ripening, I sure. Moving the tree inside will shock it some and cause it to drop the leaves quickly. Not sure what that will do to my fruit. I’m rooting for warm weather to continue for at least a couple more weeks. If past weather patterns hold, it will stay warm right up to late October. We have been getting warm, wet autumns and cool, dry springs for the past several years. Keeping my fingers crossed for figs! These photos of my garden were taken about three weeks apart. What a difference! 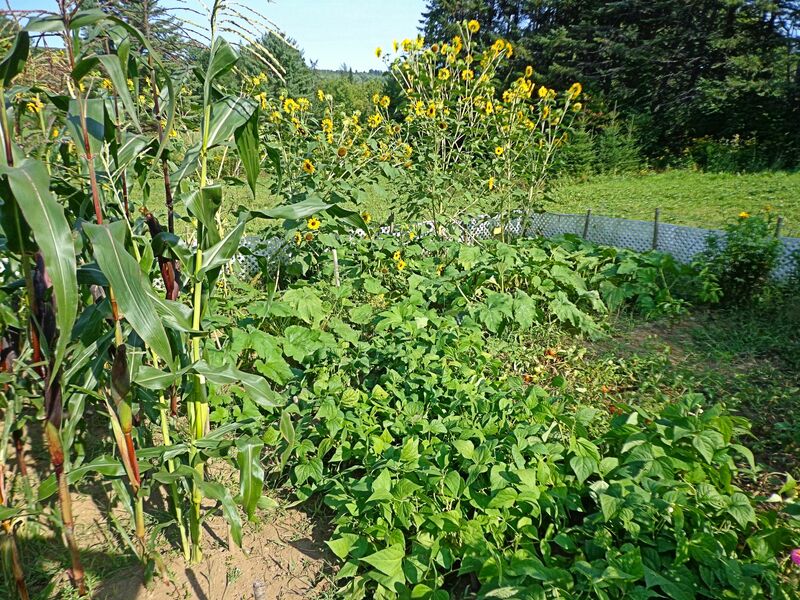 The growth of the corn and sunflowers is especially apparent. I’ve also added a run for my rabbits, an edge of which is just visible in the lower left part of the top photo. The bunnies LOVE their new 8′ x 12′ run! All the female rabbits go out together and have a great time. I will blog about them later. 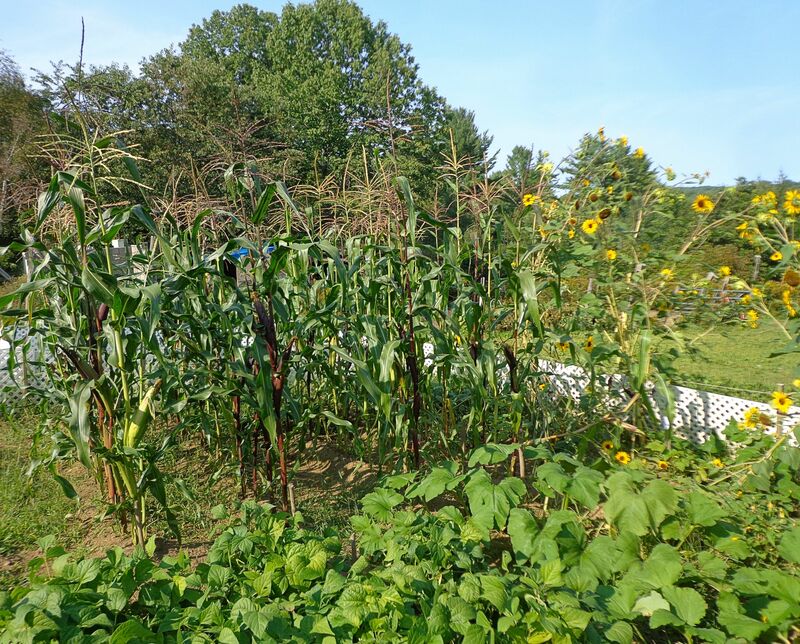 I just finished a major weeding of the garden and it’s looking pretty spiffy so I took photos to share. 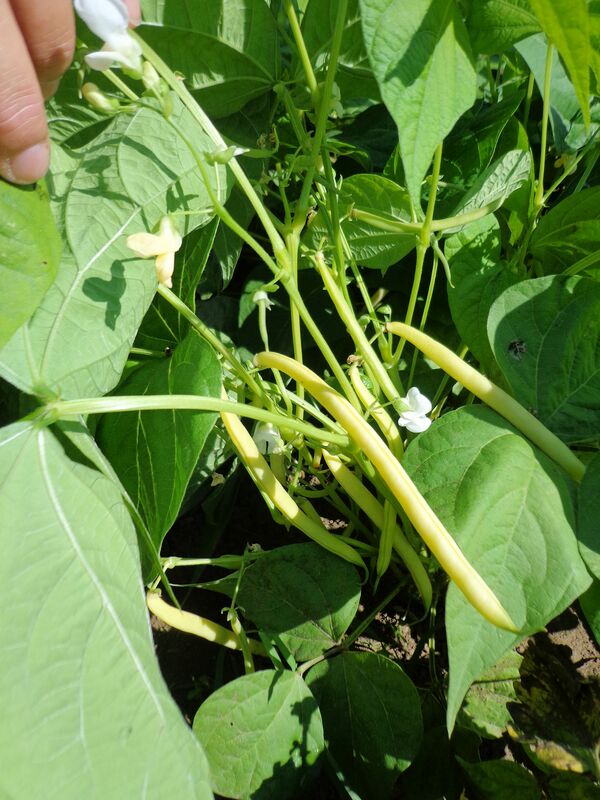 The wax beans are ready to pick! That gave me a surprise this morning. I didn’t realize how quickly they were developing. I can make a meal on just fresh wax beans. The beans are in the center of the photo on the left. They have come a long way from the struggling shoots of early June. I have harvested four tomatoes and eaten one. It was yummy! 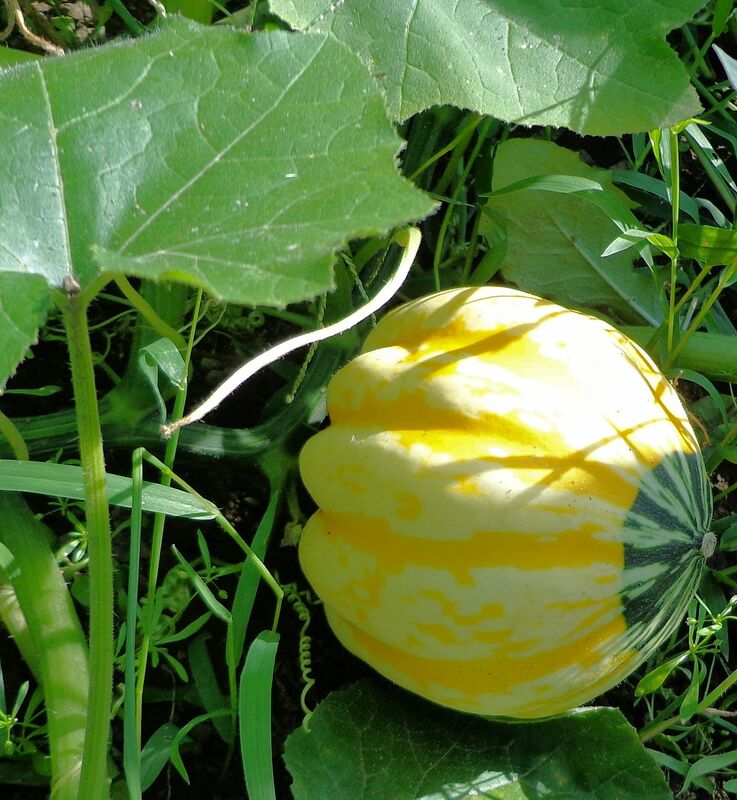 Some more are ripening on the vine. No more buying tomatoes for awhile! 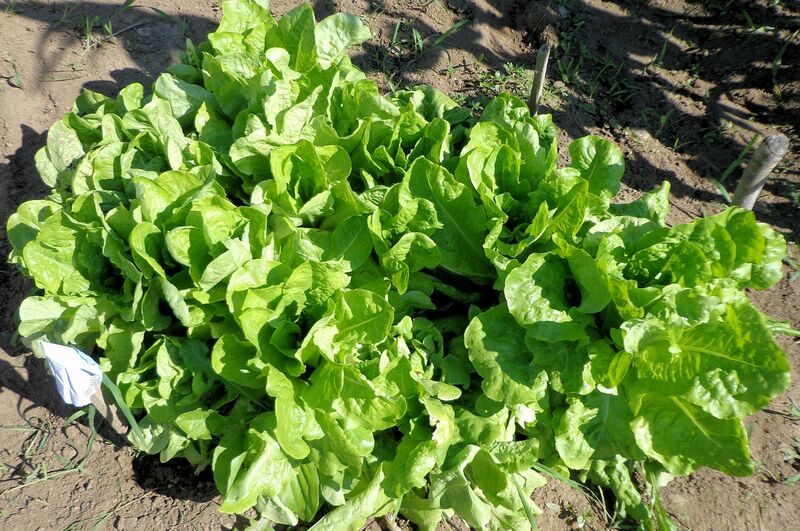 There is an ample supply of greens from the small patch of head lettuce. As the plants are thinned, I collect bags full of sweet, tender leaves. Because there is such an abundance, I share a few with the horses and bunnies. The sweet peppers are not doing a whole lot. There are a few tiny peppers to be found, but overall rather disappointing. 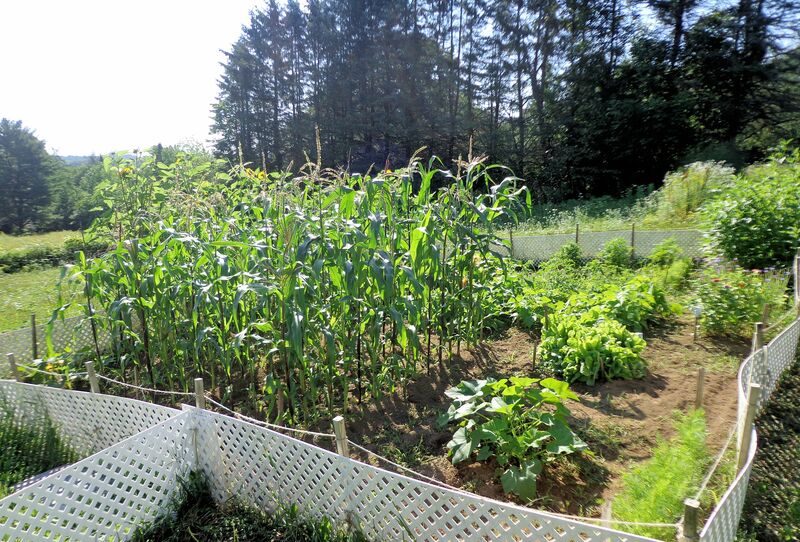 The peppers are growing in the open area of the photo at the right. There are tall marigold plants between them and the fence. I will try adding some urea to the soil around the peppers. Maybe that will wake them up. 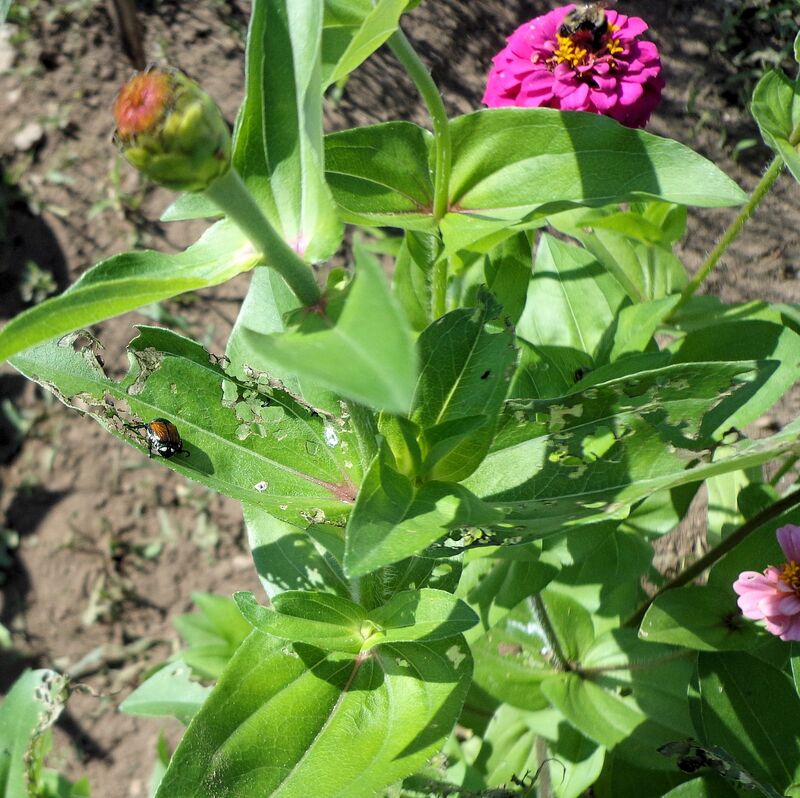 My zinnias are under attack by Japanese beetles! The nasty bugs are taking big bites out of their leaves and petals. I will set up some beetle traps to lure them away from my flowers. The strawflowers I planted never sprouted. 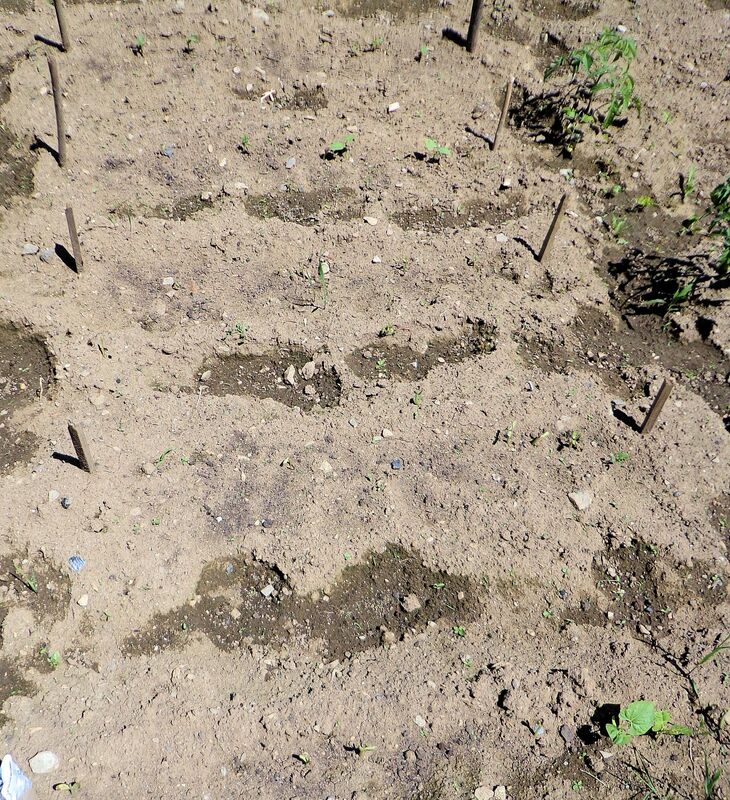 So I dug up that area and planted a row of carrots. They will be ready to harvest this fall. I wonder why none of the strawflowers came up? The seed was fresh and I planted and cared for them as directed. Oh well. That is the second time these flowers have failed me. Guess I’m done with them! 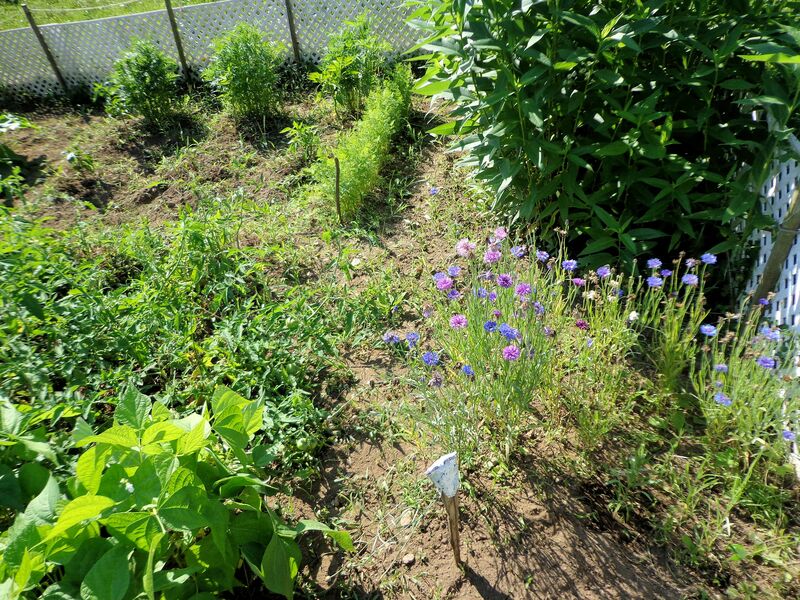 The newly planted carrot row can be seen in the lower right corner of the top photo of the garden. It is the freshly dug area just beyond the growing carrots near the fence. 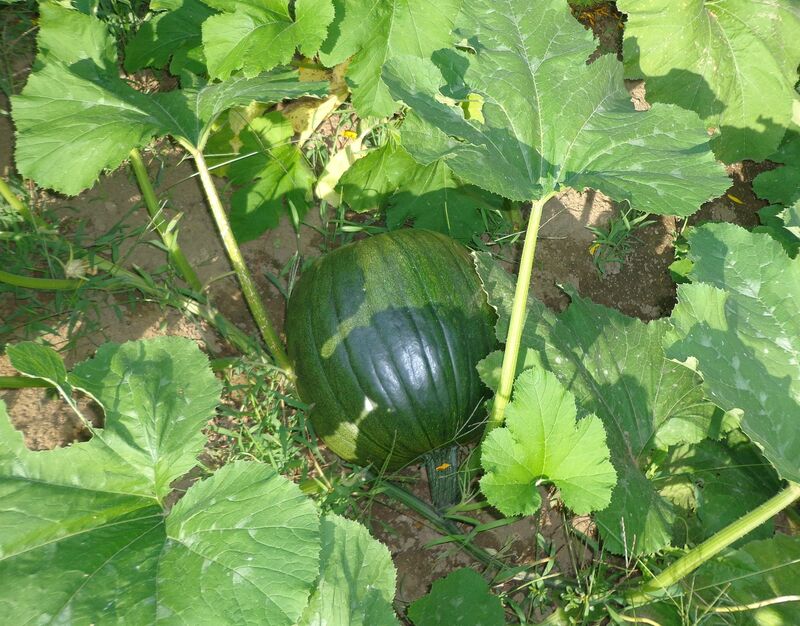 The winter squash and pumpkins are making a major growth spurt. During June they mostly hibernated, but late July saw big gains in size for them. They are busy blooming and spreading their vines. I love the sunflowers. The variety I grow has many blooms per plant. 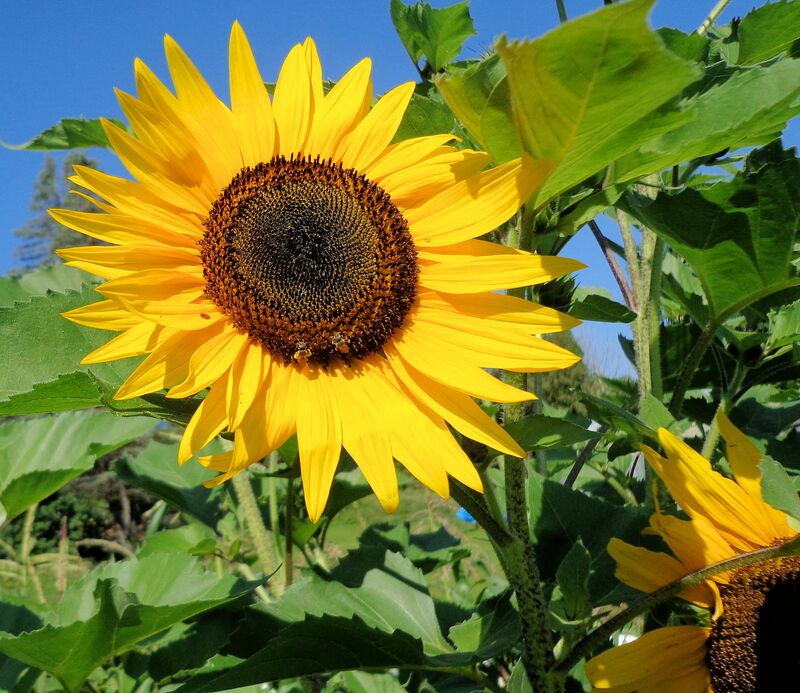 This year my sunflowers are volunteers and it looks like they all came from a yellow-flowered plant. Still they are big and beautiful. The plants tower above my head, maybe eight feet tall. Bees adore the pollen rich flowers. A small groundhog has been spotted several times trying to find a way inside the garden fence. He better stay clear! The garden this year went in about the same time as usual. It was all planted by the second day of June. 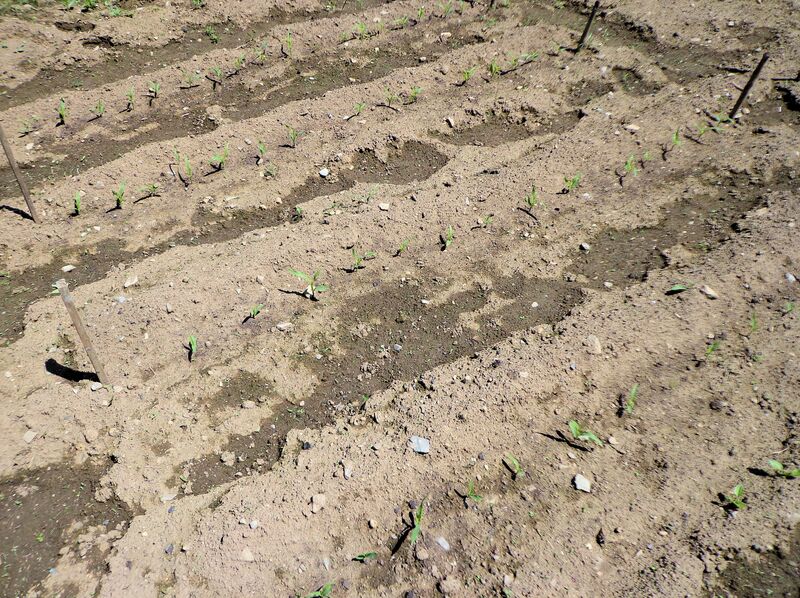 We had lots of chilly, wet weather this spring so the planting was somewhat delayed. I like to get the garden mostly done by the end of May. Since I don’t plant many cool weather things like peas or radishes or broccoli, I don’t have to bother with April garden tilling. This year would have been too wet to work the soil that early. 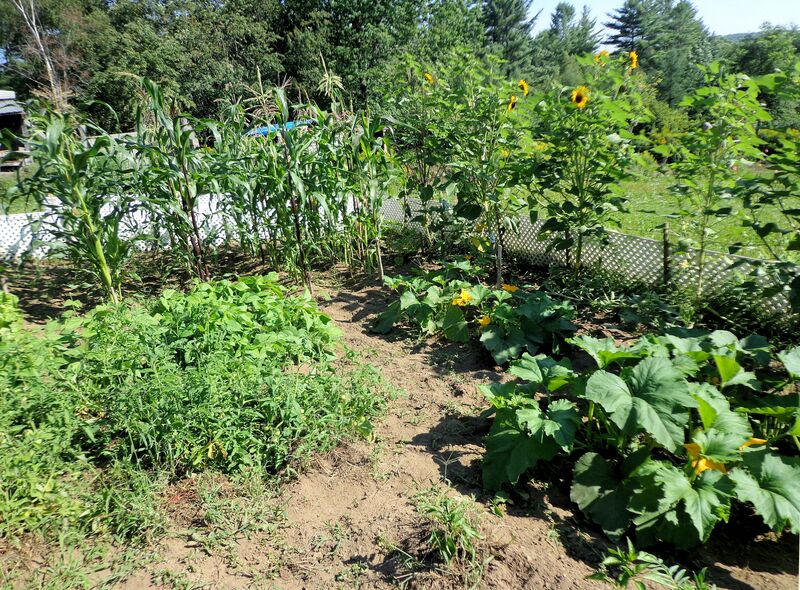 For plants I have indian corn, field pumpkins, mini-pumpkins, winter squash, carrots, Boston bib lettuce, sunflowers, tomatoes and sweet peppers. 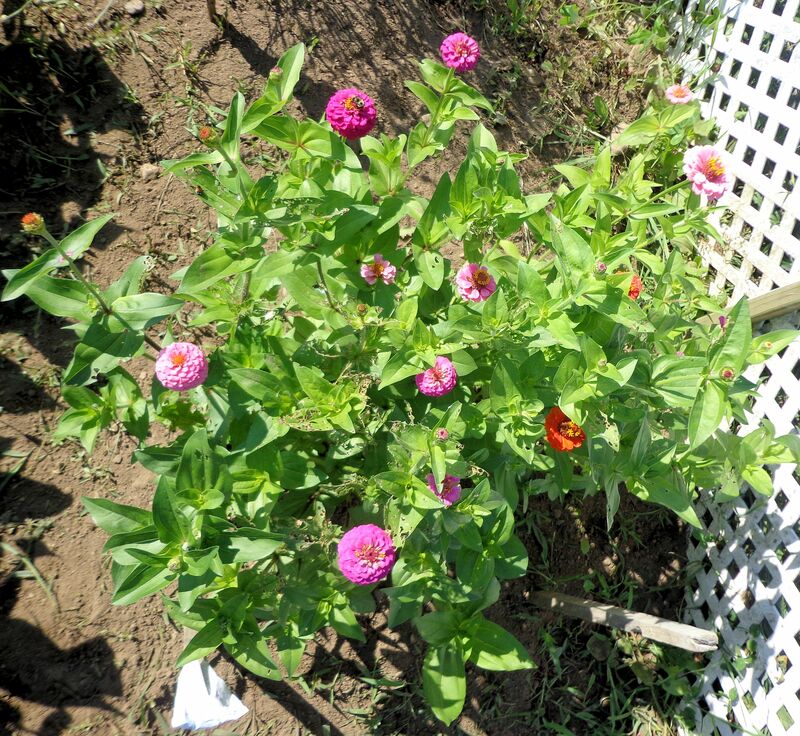 Also put in marigolds, zinnias, strawflowers, and bachelor buttons. Of course, the Jerusalem artichokes occupy one corner. 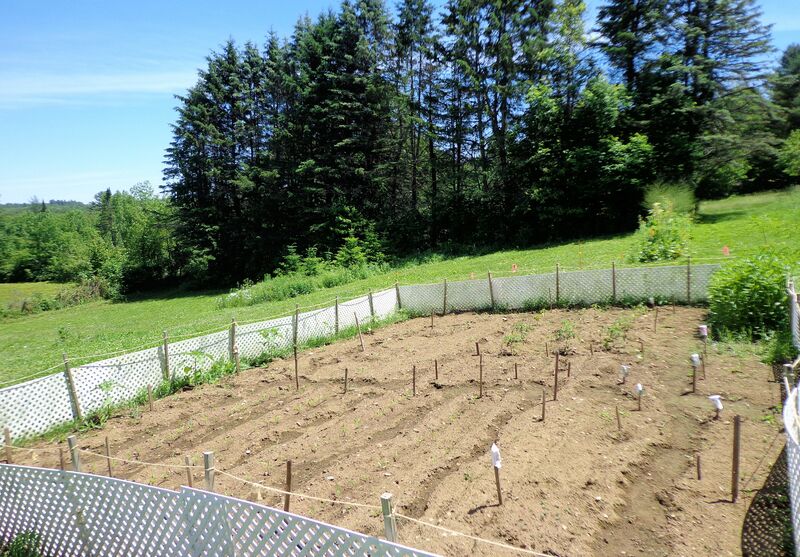 These photos were taken several days ago, right after the carrots sprouted. Since then we have gotten more rain and a few warm, sunny days. 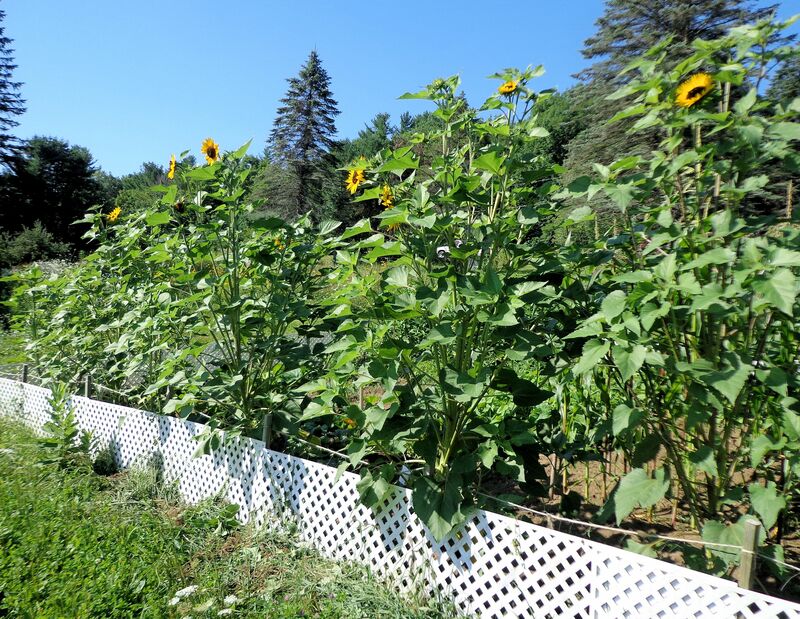 The sunflowers have nearly doubled in size since the pictures. These sunflowers volunteered from seeds left in the garden last year. 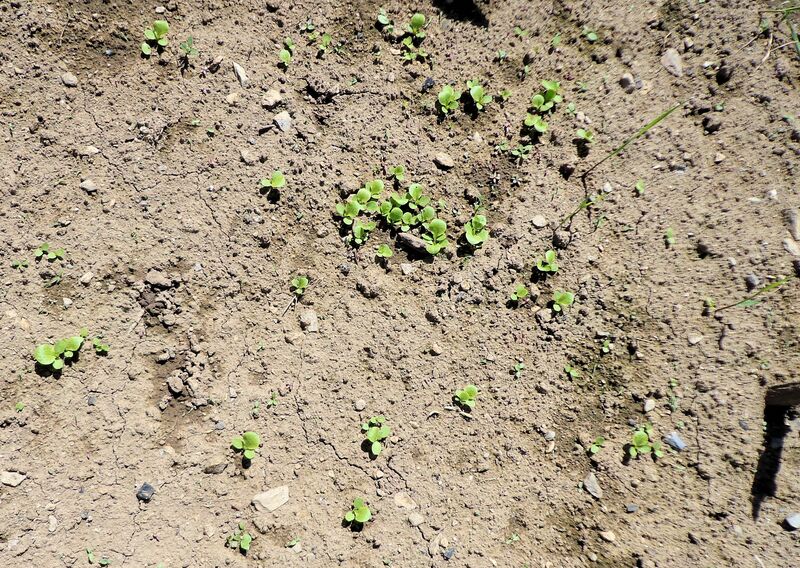 I transplanted the seedlings to the edge of the garden before tilling. They all survived nicely. 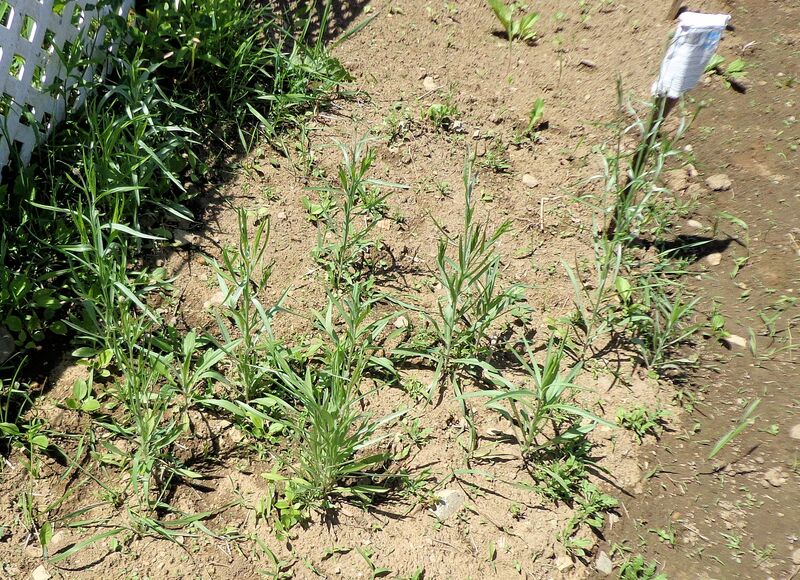 Many of the bachelor buttons are also volunteers from last year’s seed. Some are now beginning to bloom. 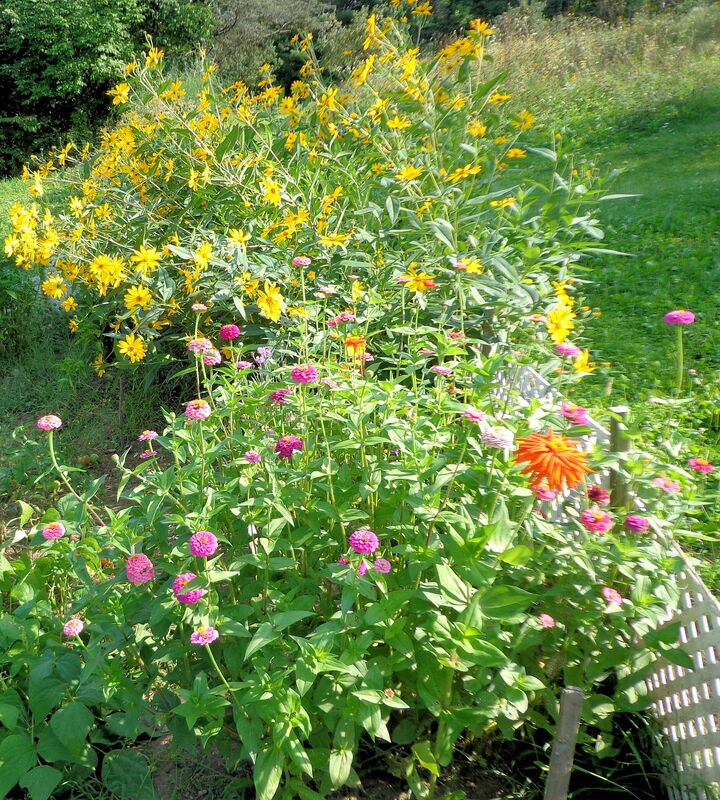 I loved these flowers so much last year that I planted several more flower varieties to enjoy. 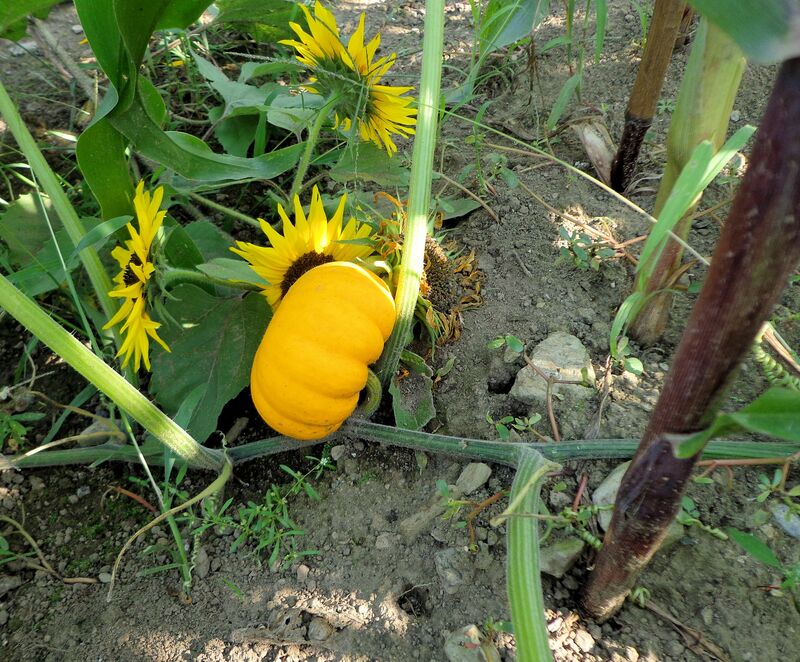 They go well with the vegetables and add some color to the garden. 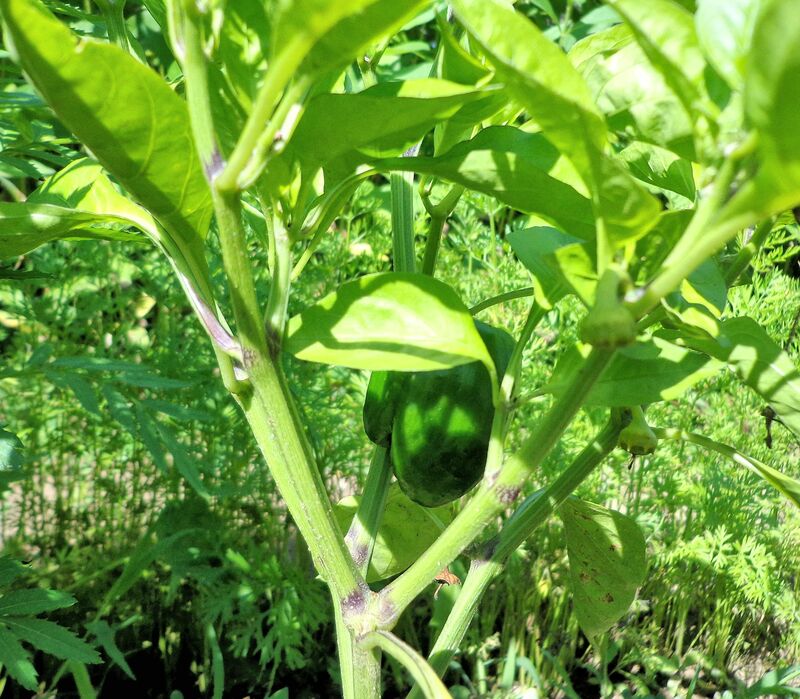 This is the first year in some time that I have grown peppers. These are sweet green, turning to red if left on the plant. 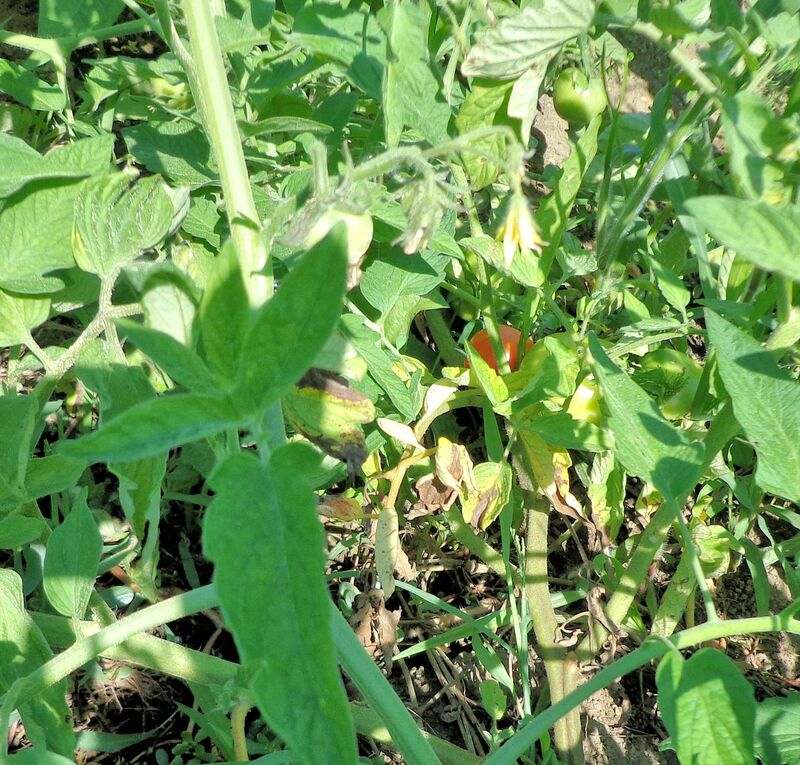 Right after I put the seedlings in the ground, something devoured most of the leaves on one plant. Not sure what did this. There were no tracks so maybe a flying creature or something very small like a vole. Why just one plant? I don’t know, but I’m glad they left the others alone. 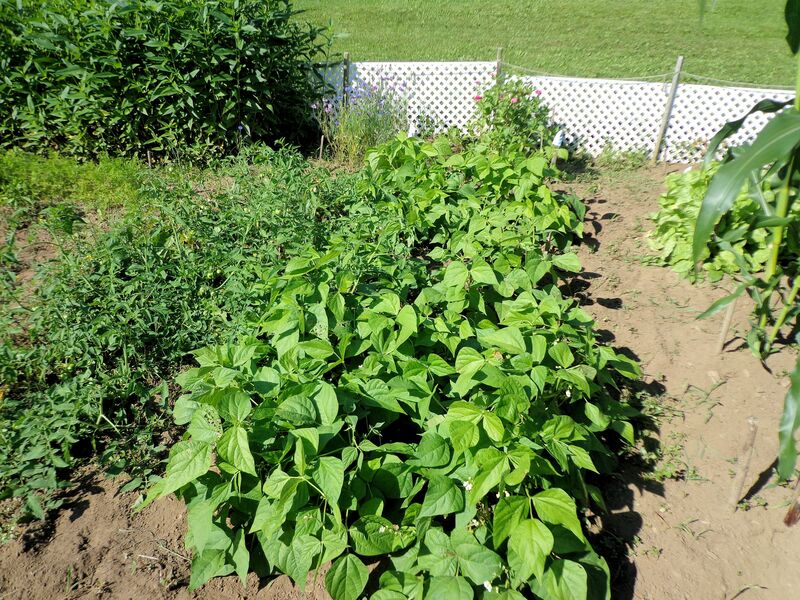 The wax bush beans are struggling. Since this photo, several more have sprouted. I will have to replant some of the rows if I want many beans. I planted six Early Girl tomatoes, my favorite variety. They are growing well. I have to mulch the tomatoes and peppers to improve their growth rate. Something I hope to do today. It’s nice to have photos of the plants when they first start out. As the garden develops I like to go back and look at how much the plants have grown.